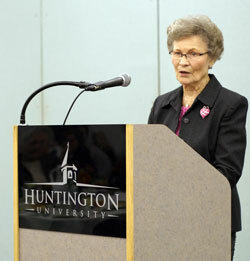 Huntington University honored the 178 Merillat Scholars at a dinner on November 6. The founders of the scholarship were represented by Dr. Ruth Merillat of Adrian, Mich. (right) and her son Dr. Richard Merillat of Naples, Fla.
Students involved in Youth for Christ in high school at the Student Leader level. Since the Merillat Scholar award began in the fall of 1994, almost $10 million has been given to more than 1000 students. The first Merillat class consisted of 29 recipients. A $2500 scholarship is awarded to students who have a 2.7 high school cumulative grade point average and a minimum 900 SAT or 19 ACT. An additional $1500 scholarship is awarded to students who have a 3.2 cumulative GPA and a minimum 1000 SAT or 21 ACT, for a total scholarship of $4000. The Merillat Scholar program is also in the second year of stacking award categories. So, for example, a student who is a member of the United Brethren in Christ Church and also a child of an alumni would receive an extra $1000. If they also happen to be a Youth for Christ student leader, they would receive an extra $500 on top of that for a total of $1500 in additional aid. The Merillat Scholar award is not based on financial need. Roger Sherman of Mainstreet Church (Walbridge, Ohio) passed away at 11:30 on November 26. He was a longtime leader at Mainstreet and second father to Senior Pastor Marty Pennington. He had suffered a massive heart attack on November 9. The funeral is 11:30 Friday, November 30, at Mainstreet Church. Bishop Ron Ramsey will speak. Donald Palmer, a former pastor in Michigan, is no longer licensed with the United Brethren church. Gary Dilley, the Director of Global Ministries since 2001, is stepping down to take on a new position. In January, he will become senior pastor of College Park United Brethren Church in Huntington, Ind. He has been serving as interim pastor at College Park since July. Gary’s original calling was to pastoral ministry, and that role remains close to his heart. While he felt God’s leading in leaving the pastorate to become Global Ministries director, he always knew he would eventually return to the pastorate. Gary was elected to the Global Ministries position in 2001. However, in 2005, it became an appointed position. Bishop Ron Ramsey will work with the Global Ministries Leadership Team in deciding how to fill the position. Cathy Reich is the new Administrative Assistant to Bishop Ron Ramsey, Pat Jones, and Steve Dennie. She started in that position on November 19. Cathy is a graduate of Huntington University, and beginning in 1975 spent nearly nine years working at the United Brethren Headquarters. She initially worked in the printshop, and in 1982 became executive secretary to Paul Hirschy, then the Director of Church Services. She left that position in 1984 when she and her husband, Jon, began having children. Cathy and her family are very active members of Good Shepherd UB church in Huntington, Ind. In recent years, Cathy has served on the Good Shepherd staff part-time as Director of Children’s Ministries. Cathy was elected to the Executive Leadership Team at the 2007 US National Conference. With her new role, she has stepped down from that position. Three United Brethren churches have seriously updated their websites. Take a look. NorthPointe Church (Lewis Center, Ohio). Dan Kopp is the pastor. Anchor Community Church (Fort Wayne, Ind.). Tim Hallman is the pastor. Union Chapel Church (Fort Wayne, Ind.). Gary Reiber is the pastor. Frank Strine, a longtime UB pastor (now retired), underwent quadruple heart bypass surgery today. Everything went well and there were no problems. As always, the next 24 hours are critical. Frank and Phyllis Strine can be contacted at PO Box 613, Markle, IN 46770. Lake View Church will offer their 18th annual dramatic Christmas musical December 14-16. The performances are open to anyone who would like to attend. Tickets are free, but are required for admission. Light refreshments will be served after each presentation. For tickets or more information, please call the church office at 517.567.8529. Lake View Church is located at 4616 E. Territorial Road in Camden, Mich., about two miles north of Pioneer, Ohio, and 16 miles south of Hillsdale, Mich.
Colwood UB church in Caro, Mich., is looking for a fulltime youth pastor, with a preferred starting date of January 1, 2008. Colwood Student Ministry (Fusion Student Ministry), a ministry of Colwood UB church, is a multi-faceted ministry that seeks a balance of worship, training, outreach, leader development, and community involvement. Currently the Sunday student average is 50-60 students. A Friday night outreach has been developed over the past three years. The purpose of Fusion is to give students a safe place to go, where they know they can trust the adults and have fun with their friends. Anywhere from 150-300 students attend this event that is held three out of four weeks every month during the school year. Colwood is looking for the person God would have to help them lead the student ministries forward. Roger Sherman, an elder at Mainstreet Church in Walbridge, Ohio, suffered a massive heart attack and is now in the intensive care unit of a local hospital. Roger is the second father to Mainstreet’s senior pastor, Marty Pennington.